Nestled in the rugged Aravallis, Alwar is a town which reflects the architectural splendor of the Rajputs and boasts of a history of conflict with Rajputs, Mughals and the British. Situated in Rajasthan Alwar was founded by Rao Pratap Singh of the Kachhawala clan of Rajputs. Invaded by the British and the Marathas, Alwar finally became a part of Rajasthan. Indiahotelandresort.com offers online booking and information on Hotels in Alwar. The Hotels in Alwar offer to the guests the best of services and amenities. 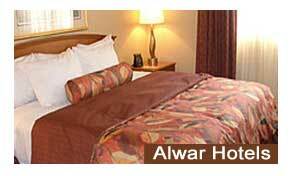 After your hectic tour in the land of kings and queens, enjoy your royal retreat in the Hotels in Alwar. From the budget hotels of Alwar for all the economy travelers to the luxury resorts, Alwar has something for all of us. Nearest Railhead: Alwar Railway Station is connected with the major states in the country. From Shatabdi Express to Marudhar Express, Alwar is connected to the rest of North India through a good network of railways. Alwar is famous for its Rajput architectural marvel and its historical associations. The major tourist attraction of Alwar is the City Palace also called the Vinay Vilas. Built in the year 1840, this palace is located atop a hill. The beautiful City Palace is a huge complex which has buildings, monuments, museums and spectacular lakes. Besides the City Palace there are other tourist places in Alwar which attract people to this city in Rajasthan. From the towering Bala Fort to the emerald green Saagar, an artificial lake in City Palace, Alwar is surely a place which is replete with monuments and architectural extravagance. From the mighty Mughal to the Marathas to the British, Alwar has often been invaded and finally it became a part of Rajasthan. So plan a trip to Alwar, a city that reflects the royal glory and grandeur of Rajasthan. Arrange for a comfortable stay in the Hotels in Alwar and enjoy your trip to this medieval city. Indiahotelandresort.com.com offers online booking in Hotels in Alwar and other hotels in India.